ContraTeam Review 2019: Is ContraTeam a Good Hosting? ContraTeam is a Serbian hosting provider. It offers web, reseller, and business hosting plans along with VPS, cloud, and dedicated servers, domain registration, audio streaming, licenses for some popular software solutions, and server maintenance services. ContraTeam’s journey started in 2007 when it was a small web design and computer service company. In 2008, it started selling web hosting services together with providing audio streaming and domain registration. Later in the same year, the company added counter-strike game servers to its bouquet of services. By the end of 2011, the company stopped its game hosting services and introduced dedicated as well as VPS servers along with video streaming. In 2013, it added cloud servers to the mix and gave a complete makeover to its website. Over the years, it has modernized its services (by adding CloudLinux OS, Softaculous etc) to meet global trends. ContraTeam’s website supports Bosnian. 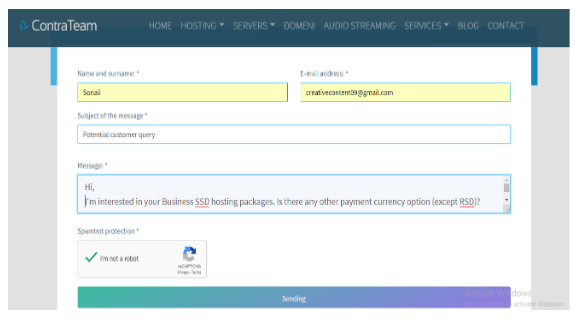 ContraTeam provides three types of hosting plans with SSD hard drives – Web, Reseller, and Business. It also offers VPS SSD, Cloud SSD, and Dedicated Servers. Domain registration, four audio streaming plans (32, 64, 128, and 256 KBPS respectively), three server maintenance services, and six licenses for some popular software solutions (cPanel dedicated, cPanel VPS, Softaculous etc) are its other offerings. ContraTeam provides 99% uptime for its web and business hosting plans, which is a bit lower than the industry average. Those who need entry-level web hosting or limited resources can take their pick from four web hosting SSD plans – Green, Orange, Red, and Black. All these plans come with a free SSL certificate and daily backup. However, they differ in terms of their space (1 to 15 GB), bandwidth (1 to 15 TB), CPU (1 core to 3 cores 3.0GHz processor), RAM (1 to 3 GB), and add-on domains (2 to 15). In case you are a business user or need a greater amount of system resources (like more RAM, larger hard disk space, multiple processor cores etc. ), you can take your pick from four business plans – Rookie, Progressive, Professional, and High-End. 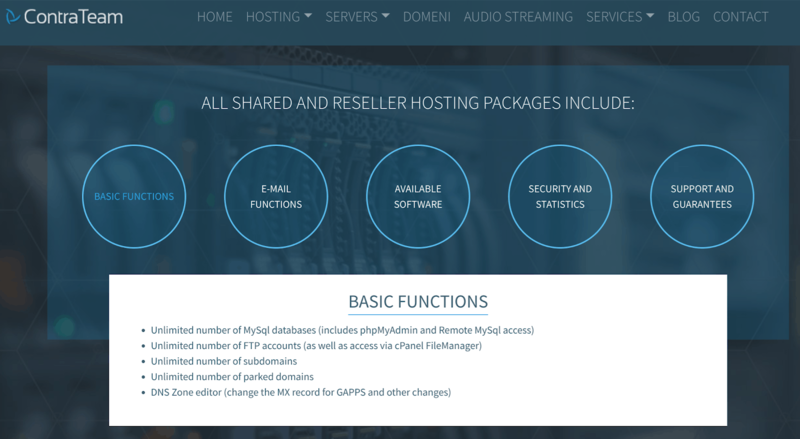 If you maintain a large number of websites and need special hosting packages, or want to start your own hosting business, you can choose from three reseller hosting plans – Blue, Green, and Orange. ContraTeam has a thirty-day money refund policy. The company’s hosting plans are competitively priced. While its web hosting plans are payable half-yearly, annually, or biennially, its business and reseller hosting plans are payable on a monthly, quarterly, half-yearly, annually, or biennially. All these plans are payable in Serbian Dinar (RSD). You can reach the company’s support staff via phone (Mon-Fri, 9 am to 5 pm, local time), email, or a ticket system. My email to them failed to elicit any response within twenty-four hours but I obviously don’t qualify (as a non-customer) for their 24/7 support. Though ContraTeam has a knowledgebase, it’s almost as good as being non-existent since it just has a solitary article. The company’s blog, in comparison, is a much better place, and may offer answers to some of your queries. If you are looking for cost-effective hosting tariffs in the Serbian domestic market, ContraTeam’s plans could be just what you need. Say “Hello!” to the world with ContraTeam’s hosting plans. Wondering how ContraTeam stacks up against other Web Hosting companies? Enter any other Web Hosting company and we will give you a side-by-side comparison.